Take immediate posession of the vehicle with a small deposit and monthly installments. UK Car Finance is a vehicle finance broker with access to over a dozen market leading prime lenders including, Close Motor Finance, Paragon Motor Finance, Hampshire Trust Bank, Hitachi Capital, Aldermore Bank and Investec. Having a partnership with these lenders allows us to offer the most competitive finance rates for UK Car Finance. It also offers the flexibility of being able to finance new cars and used cars on PCP, Lease Purchase, Hire Purchase and Balanced Payments. UK Car Finance will look to offer you Free, Friendly and Professional advice whilst offering you the most competitive finance deal on the market. UK Car Finance typically offers a wider variety of funding options than the dealer and by utilising our volume based discount deals with our funders we are able to beat the dealer quotation on most occasions. Well why don’t you try us out and call us now for a quote. 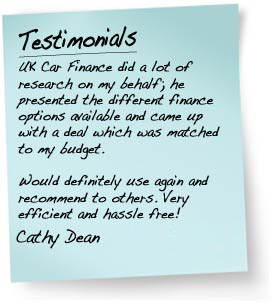 If you’re serious about getting a car on finance then we predict you’ll soon be a candidate for our testimonials wall. We are not in the business of putting down the competition to make ourselves look better. Quite simply, we offer a simple, friendly and zero hassle service for people to get finance and / or finance with a car(s). It takes 2 minutes to call UK Car Finance for the best prices and if we haven’t got what you’re looking for in our huge deals catalogue then that’s fine, we’ll leave you alone. We simply need to understand a few details so that we can pull up the best finance deals available to you fitting your budget and needs as a driver. It’s no problem if you’re not sure what car you’re after, our knowledgeable staff can give you some advice based on what you’re looking for in a car based on whether you want something for comfort, off-road, speed, or anything else you might have in mind. It is important to call UK Car Finance rather than just use our finance calculator. The finance deals change constantly and so updating the calculator for every car on the market would be an administrative nightmare for us. We like to have it there just as an indication for people perusing the market. There will be no hidden surprises, you simply receive our best quotation. As I mentioned, the UK Car Finance call centre is a hive of car enthusiasts who are there specifically to find people like you the dream motor they’ve always wanted. They have decades of experience in the motor finance industry so there’s no better place to go! You will have a dedicated customer support liaison who you will speak to from start to end so the process is as fluid as can be. What Types of Finance do UK Car Finance Offer? We often have direct from manufacturer discounts on certain prestige motors. Our call centre staff will give you details. Whether it’s a Mini Cooper, a Range Rover Sport or a Bentley Turbo you’re after, we have the finance deals and cars that suit you. Because of the relationships we have established with the manufacturers and financiers alike, we are well positioned to pass on some fantastic discounts direct to you. Often the manufacturers find themselves with a surplus of stock, which they offer at reduced rates, which we in turn pass on to you. This option allows you to take immediate possession and drive your car away on the day. A small deposit is taken and an arrangement made for monthly installments. This is similar to the hire purchase agreement where you put down a deposit and pay monthly installments but to reduce the monthly amounts a balloon payment is paid at the end of the lease purchase period, which can be 12 / 24 / 36 / 48 months. To reduce monthly payments, a Guaranteed Future Value balloon payment is made at the end of the agreement period. A PCP gives the customer the option at the end of the agreement to hand the vehicle back (to the lender) or take ownership of the vehicle. A balanced payments agreement is an agreement designed to offer customers the benefit of linking their interest repayments to LIBOR with the additional benefit of fixed monthly repayments. Do I have to buy a new car to get a payment plan off UK Car Finance? You do not have to buy a new car to qualify for UK Car Finance deals. We can offer deals on cars up to the age of 10 years. We offer an extensive range of business contracts for anything from plant equipment to van and motorcycles. All you’ve got to do is give one of our staff a call and they’ll take care of you. Far from just financing your new motor, we’re here to fill in the gaps too. We offer a fantastic Gap insurance product to make up the depreciation margin of your car in the event of a write off claim. This coupled with your existing insurance cover essentially makes up a new for old policy where your car is concerned and will help you from getting in any financially sticky situations where you owe money on a car that you can no longer drive. It’s an additional cost but it makes a lot of sense! Drive away with Comfort of mind AND comfort of Car with UK Car Finance. You can see that we are extremely accomplished in our offering. We have the connections in the industry to beat people on deals hands down; all we ask is that you give us the chance and get on the phone to us for that no-obligation quotation. We’ll more than likely see you drive off with your dream motor like we have so many of our other happy customers. Don’t delay, call 01695 586 521 and have UK Car Finance find the prestige car finance deal for you. Our live online finance calculator will provide you with an instant quote to give an indication of how competitive we really are! Please note that our best rates and quotes are available over the phone. UK Car Finance is a trading name of Independent Funding Solutions Limited (IFS). *Subject to supplying genuine quote and also excludes new manufacturers subsidised finance offers.